Compassion softens the ego, welcomes forgiveness and blesses our lives. Compassion is a powerful ally for change. The personal journey of BECOMING never ends. The surrounding environment pounds on the hard shell of our character preparing the soul for tempering. We constantly are becoming something. The years twist and bend the soul; whether we intentionally direct the forming of character or not, we still become. We influence the form through mindful attendance to experience, becoming closer to our ideal, experiencing life a little fuller and a little better. Many allow the outside forces to blindly create, accepting what biological genes, family learning and society dictates. They believe they are wise and in control but steadily marching towards fate. We, however, can gain freedom from these strict dictates of nature and nurture, loosening the chains of trajectories. But to escape the bonds, we must purposely attend and oppose the automatic processes shaping how we think and act—but we must do so kindly. We are not simple. Our personalities are dynamic—a multitude of traits combine and interact, creating character. An ingredient often lost when desiring to improve is compassion. 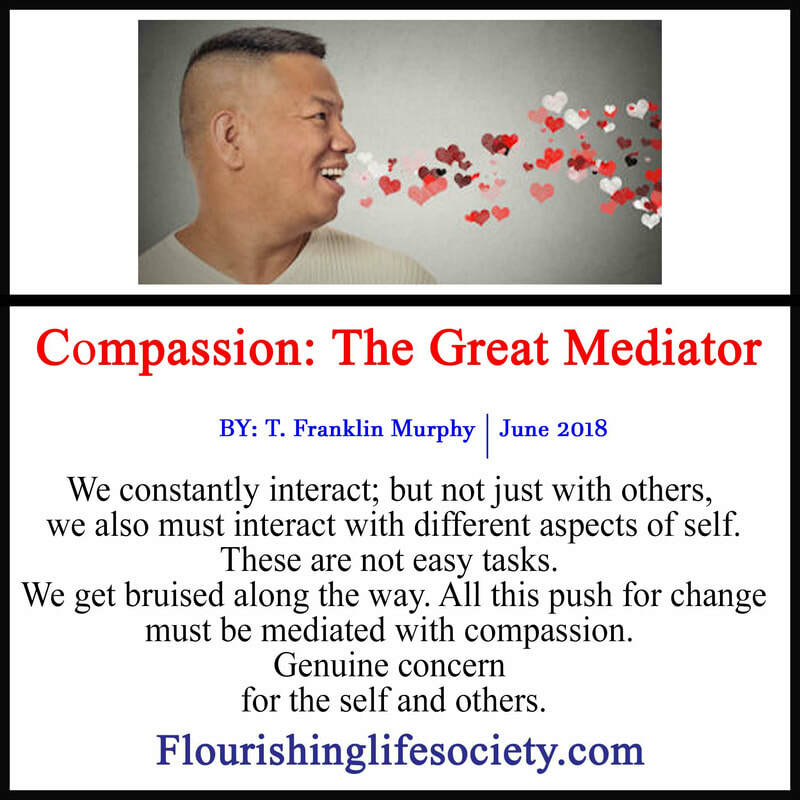 Compassion mediates the pain of growth, balancing the protectiveness of the ego, calming selfishness, and connecting the self with the larger universe. A component of compassion is kindness; but kindness, alone, is not compassion. Some acts of kindness are self-serving, pushing selfish goals for connection and acceptance. Often social circumstances impel kind acts. And tax deductions, encourage giving. We often serve, looking for praise and benefit, lapping up acknowledgement while glorying in acceptance. True compassion is often praised; but the praise doesn’t motivate the compassion. When kindness is motivated by underlying compassion, the concern for others is the motivator. A compassionate person considers others during climbs to success, interactions are viewing beyond the power of the ever-present “I”. Concern for others doesn’t require us to be self-sacrificing martyrs. The kind heart is not singularly focused. True compassion also values the self; before an action, the decision includes evaluating costs and benefits to all parties (self included). Compassion tames (not eliminating) the ego’s driving need to be right, accepted, and powerful. Compassion mediates the madness of the ego. "Some acts of kindness are self-serving, pushing selfish goals for connection and acceptance." Another component for compassion to thrive is empathy. We can have empathy without compassion, accurately discerning feelings of others. Experiencing empathy through active mirror neurons picking up on human hurts and joys. Empathy is recognizing and feeling the emotions of others. Just as we can have unhealthy adaptation to deal with our emotions, we also may have unhealthy relationships with the emotions of others. This maladaptive approach to others is much different from those who are oblivious to others’ experiences all together. Those uncomfortable with emotion respond to a partner’s sorrow by turning away, or to their anxiety with anger. They empathetically feel but destructively respond. Sociopaths master emotional discernment but lack the empathy to feel. The sickest minds recognize other’s emotional experience with complete apathy. Others, residing in middle ground, feel but reject. Compassion feels and accepts. Compassion allows for sadness to exist. Seeing the sadness evokes tenderheartedness without justifying, blaming or seeking escape. Compassion simply accepts—you feel sad and I will stand by you in your sadness. A compassionate person feels the pain, but knows the pain exist outside the self. The compassionate personal gracefully accepts the humanity of emotions without a driving need to change the feelings projected from another person. When we see someone experiencing pain, our empathy—mirror neurons—vicariously experiences some of the pain. When we see the toddler trip and skin his knee, we feel sorrow and those most sensitive even experience some of the pain. The personal discomfort drives us to action. The emotional centers of our brain fire more intensely, signaling something is wrong and action needs to be taken. We can look away, we can justify, blaming the inattentive mother; or when appropriate, we may help the toddler up and treat his wounds. But deeper hurts need more than a band-aide. Many relationships lack compassion. The empathetic but maladjusted partner feels the emotion and then responds destructively to soothe the pain. When a partner returns from work frustrated, the frustration naturally is felt by the family. These are the sliding door moments of truth where relationships strengthen or erode. The kindling is in place for combustion. Do we light a match? Unfortunately, many instead of accepting the discomfort of a partner’s frustrations, feel it but lack the emotional skills to respond appropriately. They light the match. When a partner is off kilter, instead of compassionately accepting their sadness, anger, or frustration, many respond with the same ineptness they have with their own emotions—deny, project, escape. When we struggle processing our own disappointments and frustrations, receiving the discomforts from others becomes a momentous task. We want to solve the problem to quickly escape the emotion. Guys are notorious for this. Many men struggle with emotions, so to respond appropriately to their partners emotions becomes a hurtful and continuous point of separation. When a partner’s problem is complex, the emotionally immature revert to unhealthy alternatives. Many seek relief by blaming the sufferer. True compassion doesn’t seek personal escape for relief but embraces the hurt of others with warm concern. The compassionate feel the pain of drug addiction and homelessness without a relieving condemnation, offering support without condoning the poor decisions. With compassion kindness, service and forgiveness are given to relieve pain, not a gift that is earned. Compassion isn’t purchased in a store. We don’t suddenly gain compassion where once it was missing. Lack does not become plenty overnight. Character traits exist in all of us. Some people naturally fall higher on the compassionate scale, sensitive and caring. But the ability to care isn’t completely dependent on chromosome programming. We are not damned or blessed to a predetermined state of being at birth. Our surroundings coax or suppress expression of biological coding. We all possess a degree of compassion. Most people experience feelings of empathy—feeling sorrow for the pains of others. The seeds of compassion can spring from these feelings. The skills to effectively respond to feelings, however, develop through practice. Modern day isolationists are simply wrong. Too much weight is put on individual responsibility for moods, ignoring the human need for connection. We are responsible for more than our own happiness. We can’t say what we feel willy-nilly in complete disregard for others, justifying our meanness by placing their happiness as their responsibility. These farces of psychology have a destructive force on society. Perhaps their popularity compels the destruction of healthy social skills, eliminating the great mediation of compassion. It is no wonder, we are delving into a powerful epidemic of loneliness, destroying health, and leaving vast numbers of people in severe wantonness for more. We can’t disregard fundamental needs of connection in search of happiness. Fulfillment doesn’t exist alone on an island but through healthy, shared connections with others. Human behavior is conflicted. We constantly battle with opposing forces, driven to satisfy the self, while being accepted by others. In the war between self and others, we will fall short, reverting to occasional selfishness—that’s okay. Growth is a life time endeavor. We recognize, realistically evaluate, digging deep into the soul to root out misdirected justifications, and then gently correct. With wisdom, we gain a keener sense of compassionate reactions; we challenge bias and judgmental escapes. By doing so, we mediate the battle, relieving the stress of the narrow focus of self, and expanding our joys in the service of others.